Once again, Best Buy is having a sale on iTunes gift cards, clearly in attempt to attract those of you who aren't quite done with their holiday shopping. The big box retailer is offering a $100 iTunes gift card for $85 (shipping is free), and the credit is good towards the purchase of not only iPhone and iPad apps and games, but also books, movies, music, and more. Best of all, if ordered on time, the voucher will arrive before Christmas, meaning that it could make a very nice gift for a loved Apple fan. 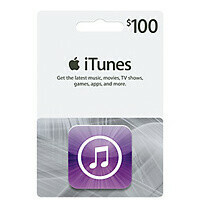 Keep in mind, however, that the $100 iTunes gift card is on sale at Best Buy for today only. Moreover, the deal is available exclusively online, at the retailer's virtual store, although you can also opt in for in-store pickup. There is a limit of only one gift card per customer and the quantities are limited. With that out of the way, follow the source link below in case you are interested. Those of you who are thinking about getting one, what are you planning on spending the money on?